This story is kind of like World War Z meets 2001: A Space Oddyssey. SO. MUCH. TENSION. An unpredictable AI who may or may not be trying to kill everyone, plus a highly contagious epidemic of people basically turning into paranoid, violent zombies. In a closed spaceship. In the middle of outer space. With an enemy ship closing in behind them. Are you on the edge of your seat? OMG, you should be. The story is told through various “records” like emails, interviews, crew reports, and instant messages. At first I didn’t think I’d like this. I felt like it really limited how things unfolded, but once I got past the first couple of chapters, I felt like the pacing and the choice of which documents are included and the order in which they appear really adds to the feeling of tension building and building as the story progresses. I loved the quick, witty dialogue between characters, especially Ezra and Kady. What I didn’t love quite so much was that after a while, it seemed like that voice got used too often and too many characters sounded the same to me. I was definitely willing to overlook that, though. It hardly affected my ability to enjoy the story. It was just more something I happened to notice. Also, the end was fantastic. There was a moment in which I worried that it was going to all wind down leaving me bitter and disappointed, and instead Kristoff and Kaufman totally kicked it up a notch. I would absolutely read a sequel. Side note: I read an ARC acquired from Netgalley, so the formatting in my version may not match the final version, but I’d recommend ordering a hard copy of the book rather than an ebook. There were a few pages that, because of how they displayed, were a little bit difficult for me to read, and I felt like I was missing parts of words at the edges of the page. I think it might have been easier to read as a paperback, though I usually prefer an ebook version. Loads of profanity and some crude references. A biological warfare agent/virus causes those affected to become violent. Sufferers maim and decapitate others. Lots of descriptions are of the aftermath of the outbreak, but there are some really intense moments in which a point-of-view character faces someone with truly gory intent. I’m pretty sensitive to violence in literature, and it was definitely at my upper limits of what I can take. 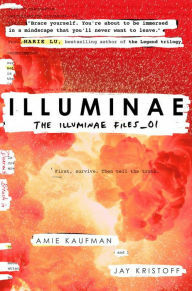 Tagged Amie Kaufman, Artificial Intelligence, Illuminae, Illuminae Files, Jay Kristoff, Knopf Books for Young Readers, Random House Children's Books, Zombies in Space. Bookmark the permalink.